And so goes a typical conversation in my house when it gets close to dinner time. It’s usually a battle between what my wife and daughter like best, and me trying something new. But it’s usually pretty darn tasty, whatever it is. And once my daughter tasted my homemade Teriyaki Sauce – I knew this would be another keeper. 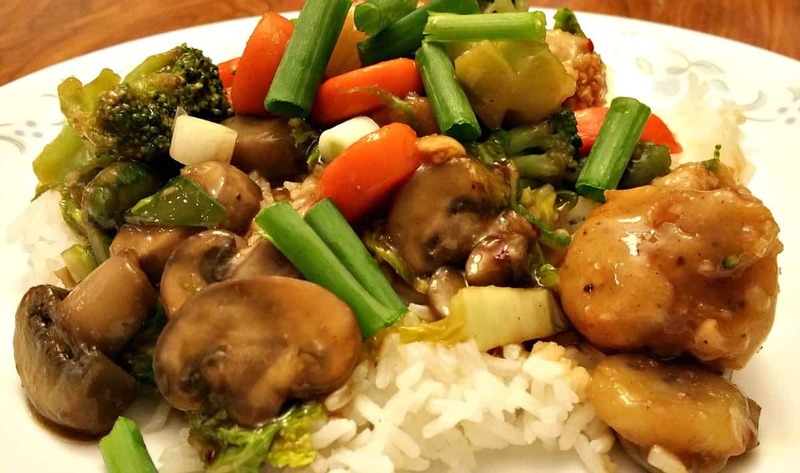 This Teriyaki Stir Fry uses the same formula as my other popular stir frys – which is what makes them so easy to prepare. Prepare the Sauce – in this case the Teriyaki Sauce. 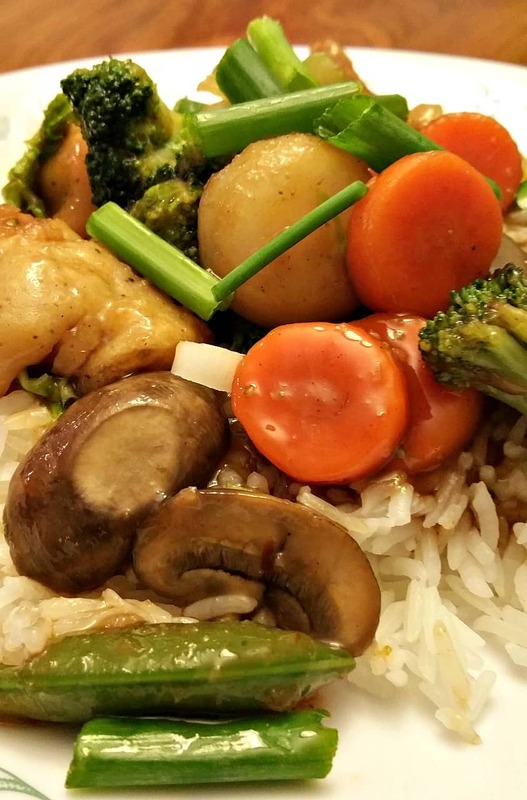 Stir fry some veggies until crisp tender, toss in the “meat”, and then stir in the sauce. If you use parchment paper on your cookie sheets while baking the cauliflower or tofu, cleanup is usually pretty easy. In this recipe (and my Orange Chicken Recipe) I make a batter out of 1 cup of flour, 1 cup of almond milk, some salt, pepper, and garlic powder. Then I dip raw cauliflower pieces into the batter until they’re completely covered and then bake them at 375 for about 45 minutes. Parchment paper makes cleanup a cinch. I also sprinkled some Panko Bread Crumbs over them this time to make them a little more crunchy. Sesame Seeds would be good too. Totally optional, but good either way. 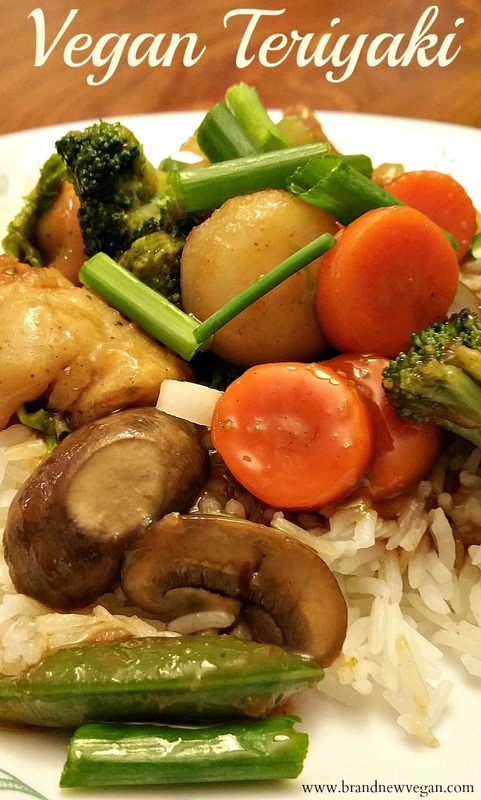 The Sauce in this recipe is a typical sweet, sticky, Teriyaki Sauce. I used soy sauce, ground ginger, ground garlic powder, Chinese 5 Spice Powder, brown sugar, and honey to make the sauce. The Chinese 5 Spice Powder should be available at your local grocery store. I’ve included an Affiliate Link to Amazon here for those of you who cannot find it. Although you could probably leave it out of this recipe – it does as some additional flavor to the sauce. Note: As always, affiliate links mean I make a few pennies if you click on it and buy it. I legally have to disclose that. 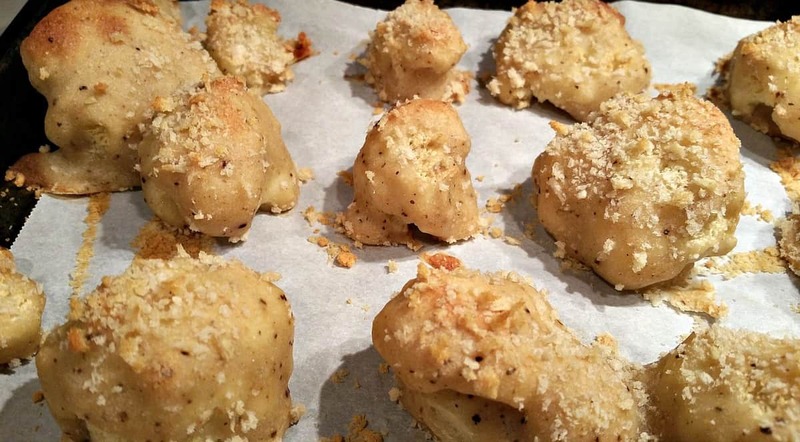 Another thing – I do use honey in this recipe. Some Vegans avoid honey – some don’t. I do buy all my honey locally from a nearby farm so I know it is made organically and from well treated bees. If you are Vegan and choose to avoid honey, you might try substituting Agave Nectar instead. Also – this is a sweet sauce and does include sugar. I have no experience with Date Pastes or any other alternative sweeteners, so if you choose to sub out ingredients, just know that is may change the taste. I personally don’t eat a lot of sugar, but I also do not avoid it completely. It is the processed oils and fat that I worry about more than sugar. In a medium-sized saucepan, combine 1/4 cup soy sauce, 1 cup of water, 1/2 tsp ground ginger, 1/4 tsp garlic powder, 1/4 tsp Chinese 5 Spice Powder, and optionally, for a little zing, 1/2 tsp of Chile Garlic Paste. Stir in 5 packed Tablespoons of Brown Sugar and 1 Tablespoon Honey and bring to a simmer. Once the sauce is simmering, stir 2 Tablespoons of corn starch into 1/4 cup of cold water to make a slurry, and then stir this into your sauce to thicken. Stir Frys are awesome in that you can use all kind of veggies. 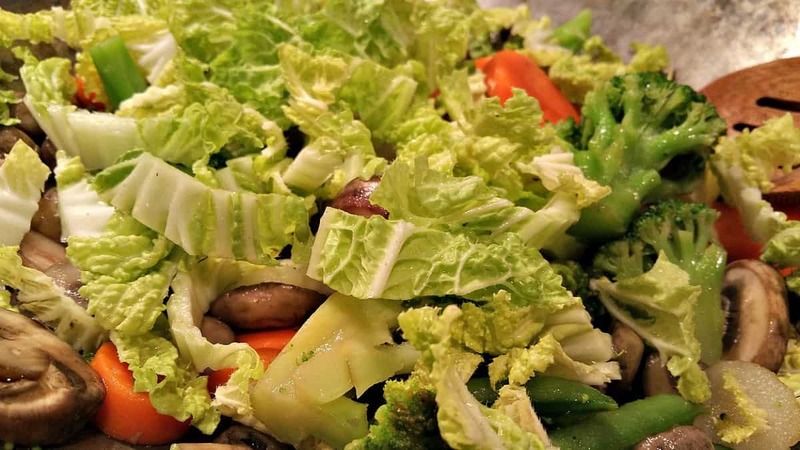 In this Stir Fry I used a 12oz bag of Stamfresh Veggies (Broccoli, Water Chestnuts, Carrots) , an entire 8oz container of white Mushrooms, and about 1/2 a small head of Napa Cabbage. I added the mushrooms first with a splash or two of Soy Sauce to keep them from sticking, and then once they started to soften and release their own liquid added the other veggies. Once they have softened, add in the cabbage and frozen veggies and stir fry until crisp tender. Now add in the Cauliflower Bytes (which should be done by now) and then pour in the Sauce. Stir well until everything is coated and then serve over your favorite kind of rice. Finally, just so you know – I just added a new Menu Item under Recipes called….STIR FRYS! That should make it easier to find all the stir fry recipes I’ve added over the last couple of years. As always, keep those wonderful comments coming. I do read each and every one! 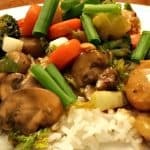 A quick and easy Stir Fry using baked Cauliflower, Frozen Vegetables, and a homemade Teriyaki Sauce that comes together in minutes! Better than takeout!